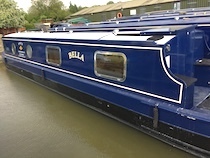 The S-Bella class canal boats. 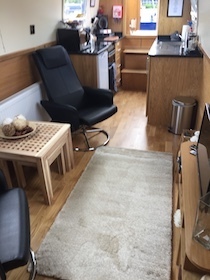 The engineered oak flooring is laid throughout the boat giving the boat a real warm and homely feel and appearance leading you into the open plan living/dining area where you are furnished with a sofa and armchair, a TV and radio and a table is also provided for you to pull out so you can enjoy a dining area. Freshly laundered bedding is supplied for each crew member, as per your requirements. Additional bedding is available upon request. Towels are also supplied - one medium sized towel per crew member, and one hand towel per bathroom. Dressing Gowns are also provided. The luxurious kitchen is fully equipped and has a 4 burner gas cooker with grill and oven; refrigerator; sink and drainer; saucepans; cooking utensils; crockery and cutlery appropriate for the number of berths. There is plenty of storage space and work surfaces. The bathroom consists of a lovely shower suite within subtle and high end decorative surroundings, spacious and light, there is a wash hand basin, electrically operated flush toilet and shower and a 240v shaver socket . 12v mobile phone charging point (please remember to bring your own car charging lead). 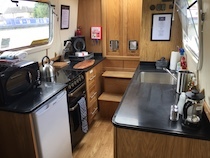 The 2kw inverter supplies 240v electricity to certain appliances and to a socket on the boat and there are USB charging points. 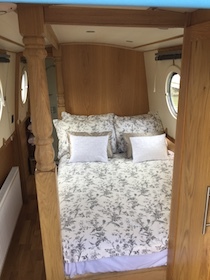 There is LED lighting fitted throughout Bella and also some under gunnel mood lighting that can be altered to reflect the mood and the occasion of your special trip.